According to a study by Ohio State University cited on the Business Insider, more than 60 percent of the restaurants close or change ownership within the first five years of establishing. So, apart from top-notch food and service, what else can save your dream from biting the dust? An important, but often ignored solution, is to have a solid marketing plan for your restaurant. To make sure that ample profits make way towards your business, you should up your marketing game immediately. Not only does it help you get new customers, but also helps in online visibility. Most restaurant owners think that an effective marketing campaign will cost bucket loads of money. But with the advent of technology and social media platforms, it is possible to promote your restaurant in a fraction of the cost. All you need are some creative ideas and a little technical know-how, and you can make a significant impact on the success of your restaurant. Here are five simple ways you can advertise and market your restaurant by staying within your budget. Most restaurants often ignore the importance of a website. But when local customers search for restaurants, you’ll want your restaurant’s name to pop up on the first page. You should include the cost of hosting and maintaining a website in your marketing plans. There are many affordable options where you can register a unique domain name and host a site. Some of the trusted ones are GoDaddy, Wix, and Weebly. Most of them even offer website design templates which can be used to create an eye-catching website with a little bit of DIY. Once your website is up and running, make sure to update it regularly. Upload good pictures of your signature dishes and highlight the interior décor of your restaurant. Consider hiring a professional photographer, because most customers eat with their eyes. Finally, don’t forget to invest your time in restaurant analytics. A functional data analysis tool can make your life easier by providing you insights about your customers based on their location, food choices, payment modes, visiting patterns and much more. Use this information to tailor your services and marketing strategies to maximize profits. Don’t underestimate the power of social media while marketing your restaurant. Nowadays, almost everyone is plugged into an online social network. Create a Facebook page, if you haven’t done it already. Keep posting about your menu and showcase your niche through the page. Posts should be short and exciting, preferably accompanied by an eye-catching picture. Promote your restaurant further by encouraging customer check-ins and run a contest. Try to grow your page organically and expand your local reach without falling into the trap of paid likes and followers. Increase your restaurant’s visibility within the local community by offering to cater at school events or the local media stations. Participate in as many community festivals as you can, and people will start recognizing your restaurant. Sponsor a charity event. Contact your local news channel and ask them to run a piece on your restaurant. You can ask them to interview your chef or advertise cooking classes led by him. It might seem a bit daunting initially but think of it as an investment. Exposure to the community will get you future business. Google My Business is a free mapping service that can be used by all its users to find a restaurant within their local area. It is a quick and easy way to put your restaurant out there. By setting yourself up on Google My Business, your restaurant will pop up every time someone in your area searches for a place to grab a bite. Encourage happy customers to leave positive reviews will help to boost your Google listing and make your restaurant stand out. Identify the offices, banks, malls, and supermarkets around your restaurant. Their employees are most likely to be your regular customers. Create a VIP card that offers a unique discount, and deliver it to them. You can add various offers like providing them 30% off at lunchtime from Monday to Saturday. Most people can’t resist an offer, and the people working around the area will become loyal to your restaurant. This strategy will guarantee constant revenue during lunch hours. Just because you have a limited budget doesn’t mean that you should settle for outdated marketing practices. These simple yet cost-effective marketing strategies will work wonders to increase business. The key is to grow your online and community presence and keep an eye open for marketing opportunities. Also, stay updated with your competitors and learn from their successful advertising campaigns. You can also reach out to all your local eateries and start your online group or local festival. There are countless ways to promote your restaurant on a shoestring budget. The time and resources you’ll invest will bring you even better results than you expected. What kind of restaurant advertising ideas or marketing strategies and tools do you use to get the cash flowing? Share your ideas and experiences with other restaurant owners in the comments below. Need an Affordable POS System to Manage Your Business? 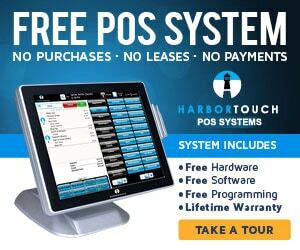 Give Harbortouch a try with a 30 Day Free Trial! Learn more about Harbortouch products and services here https://www.harbortouchpossoftware.com or visit our Google+ page.